C&W Red Danger Barricade Ribbon Tape - 3'' X 1000 ft • Bright Red with a Bold Black Print for High Visibility • 3'' wide for Maximum Readability • Tear Resist Design • Danger Tape. Prevents accidents and ensure safety through C&W Red Danger Ribbon Barricade Tape. An ideal safety measure to indicate that certain places have immediate danger or high potential of safety and health concern. C&W Red Danger Ribbon Tape is durable, thick and tear-proof hazard tapes to warn passers-by and civilians to be more vigilant and avoid dangerous areas. Specifically, design to alert individuals, the red color and bold "DANGER" sign, allows maximum visibility and optimum readability. 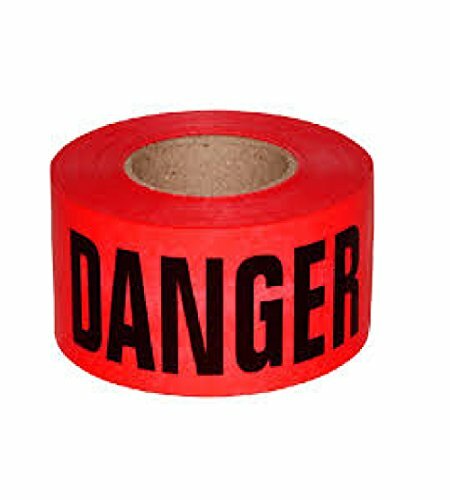 Buy the C&W Red Danger Ribbon Barricade Tape, your ideal marking solution, and hazard sign. It features 3-in X 10-feet length to cover a wider range. DURABLE CONSTRUCTION - Features thick, high-quality, non-adhesive polyethylene (PE) material to withstand windy outdoor weather, rain, sunshine and different kinds of exposures. PREVENTS ACCIDENT - Ensures that passers-by are safe from immediate dangers, such as overhead loads, suspended loads, work being performed overhead, high noise exposure, open holes, confined spaces and more. DESIGN FOR MAXIMUM VISIBILITY - Designed with a bright red color to capture people's attention. With bold and black, "DANGER" signs for better readability. If you have any questions about this product by C&W, contact us by completing and submitting the form below. If you are looking for a specif part number, please include it with your message.